It is rather surprising that with all the war movies that have been made in India, not one has ever focused on our naval forces, let alone one set in a submarine. Therefore, the promos of The Ghazi Attack brought with them a sense of intrigue. When one thinks of movies set on a submarine, the mind goes to the dark and claustrophobic Das Boot, the tense Cold War thriller, The Hunt for Red October, the gripping Crimson Tide, and the classic, Run Silent Run Deep. The question here is, can debutant director Sankalp Reddy make an impact, through the narration of a war tale, long forgotten, the tale of the sinking of PNS Ghazi? The year is 1971, with the Bangladeshi Mukti Bahini stepping up offense against the Pakistani colonists, and reaching out to India for support. The Pakistani Navy decides to send across supplies to the men behind Operation Searchlight through the Bay of Bengal, and rely upon the legendary submarine PNS Ghazi, the lone Pakistani hero of 1965, to see this through. 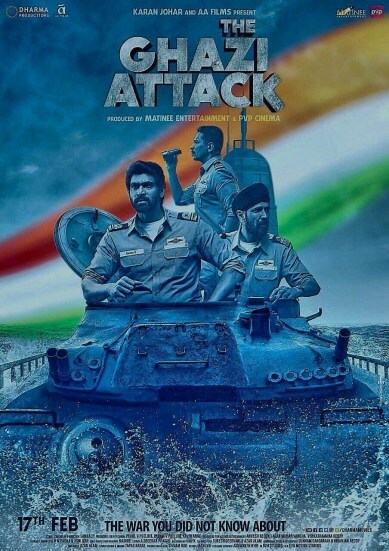 Led by the wily Captain Razzak (Rahul Singh), they plan to attack the port of Vishakapatnam, home to the Eastern Naval Command, to create a diversion, and the only thing standing in their way is INS Karanj (S-21), led by the ruthless Captain Rannvijay (Kay Kay Menon) who is at odds with the CO appointed Special Officer, Lt Arjun Verma (Rana Daggubatti) over whether to engage with the enemy or not, much to the chagrin of the Second Officer, Devaraj (Atul Kulkarni). Will the Pakistanis succeed in denting the Indian Morale, or will the commanders of S-21 put aside their differences for once? First things first, one must give credit to debutant director, Sankalp Reddy for keeping proceedings absolutely taut through the entire movie. Right from the opening credits till the end, the audience is kept at the edge of their seat, as the screenplay and the brilliant camerawork by R Madhi capture perfectly, the claustrophobia and the tension on board, as the 2 commanders of their respective machines face off against each other in a battle of wits underwater. However the movie does misfire quite spectacularly in 3 places, firstly, the absolutely atrocious special effects depicting the external shots of the submarines and the warfare between them. But that may be excused citing budget constraints as a reason. But what would explain the sudden burst of hyper-jingoism during the final act, the on-screen proceedings resulting in absolute bemusement of the audience, as it takes a 180 degree turn from an otherwise highly restrained portrayal of wartime. And finally, must Pakistanis ALWAYS be portrayed as snarling morons who react to every situation with flaring nostrils and incomprehensible dialogues? Performances wise, Kay Kay Menon absolutely hams it up as the war-mongering Captain, who mourns for his dead son, lost to the 1965 war, and finds solace in the works of General Patton, whose bluster he seems to be channelling throughout. Rana Daggubatti’s limited acting abilities are smoothened over with a role that requires him to either be poker faced or scowl decisively. It is however Atul Kulkarni who is absolutely brilliant as the good natured 2nd Officer who tries to keep things civil on deck while trying to also ensure the success of the mission. Rahul Singh as the Pakistani Captain attempts to out-ham Menon and almost succeeds. The most bewildering part here is the need for Taapsee Pannu’s character who only exists to look like a deer caught in the headlights every time the vessel is under attack. Veteran actors, Om Puri and Nasser show up in cameos as the commanding officers, but don’t really have much to do here. Telugu actors, Bharath Reddy, Ravi Verma and Sathyadev Kancharana provide able support as other crew members on the submarine. Overall, The Ghazi Attack is a pretty watchable military thriller, that ends up coming undone by the overt jingoism in its final act, although, going by the audience reactions, that might not be much of a problem!